Anwar (left) attends the PKR meeting at Hilton Hotel Kuching. Baru was not in attendance. 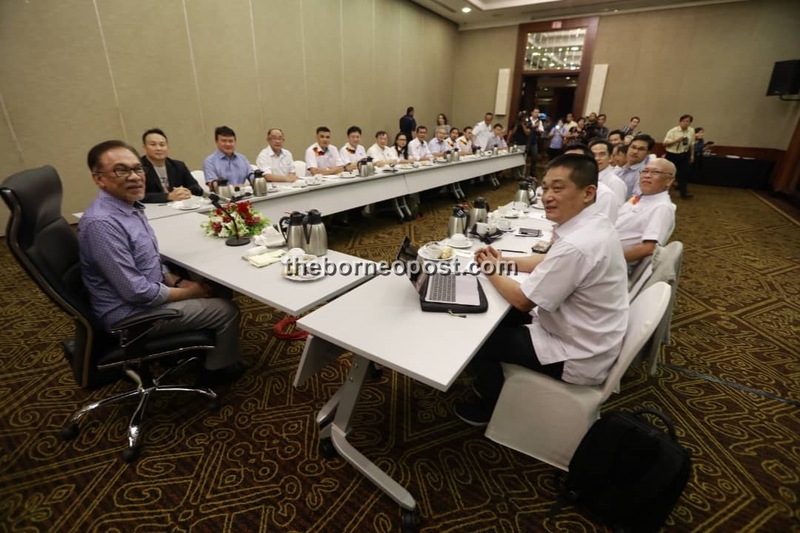 KUCHING: Works Minister Baru Bian was missing from the Parti Keadilan Rakyat (PKR) Sarawak meeting attended by its president Datuk Seri Anwar Ibrahim at Hilton Kuching today. Anwar, who arrived at the hotel at around 3pm, was welcomed by Baru Bian challenger, Miri MP Dr Michael Teo Yu Keng – the man widely tipped to be the new PKR Sarawak chairman. When met, Dr Teo confirmed that he is offering himself to contest for the Sarawak chairman post. “Yes, that is right. I am offering myself. Anyone is free to offer himself,” he told The Borneo Post. Unlike other states, PKR Sabah and Sarawak were given autonomy to elect their own branch chairman. Dr Teo also admitted that there was vote lobbying among the candidates. “Yes, there has been some campaigning, but we haven’t gotten our supporters to carry banners yet,” he jested. Dr Teo said they were notified about the meeting last week, and that Baru Bian should be fully aware. Meanwhile, a branch leader aligned to Baru Bian’s camp insisted that the Minister is absent with permission. When asked to be quoted, the party leader was quick to say no. Baru could not be reached for comment as of press time. The results of the vote would be known in the next few days, Dr Teo revealed.